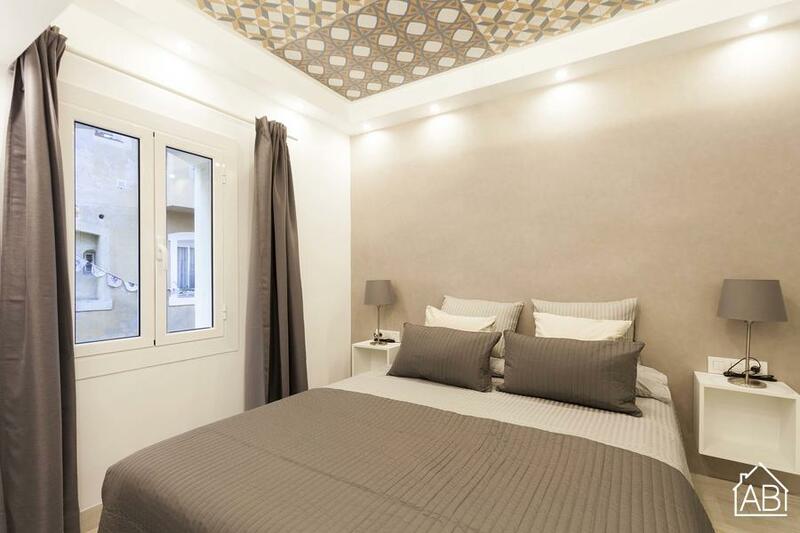 This apartment for two people stands just a stone’s throw from the beach and the Mediterranean Sea in the neighbourhood of Barceloneta. The area is vibrant, buzzing with runners, cyclists, cafés, bars and restaurants. The main attraction of Barceloneta is, of course, the beach. Offering water sports, beach bars, volleyball and plenty of sun, this neighbourhood is a prime part of Barcelona life. The renovated apartment is modern, light and spacious. The open-plan kitchen, dining and living area features contemporary décor and furniture including a large sofa, television and dining table and chairs. The space also features glass doors that open up onto a private balcony. The refurbished kitchen features modern units, a large fridge-freezer, hob cooker and microwave. The bedroom features a large double bed, extensive fitted mirrored wardrobe and large window which allows plenty of natural light to enter the room. With internet, a TV and a washing machine, this apartment is perfect for long stays. Furthermore, air conditioning and central heating provide ultimate comfort any time of year.